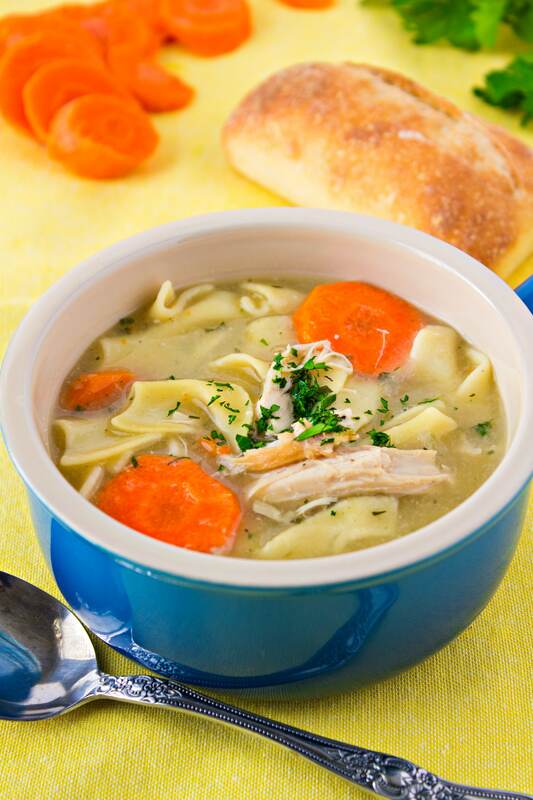 Turkey Noodle Soup – A super easy turkey noodle soup to warm you up on cold nights. And the perfect way to use turkey leftovers! Happy Monday! Or should I say…Happy Cyber Monday! If you’re anything like me, you’re doing all your holiday shopping online. Anything to avoid the craziness of the mall. I can handle the crowds inside but the parking and traffic drives me absolutely bonkers. So I take advantage of the online deals. Do you??? I promise to make this post short and sweet so you can get to your shopping list. Today’s recipe is a useful one! Or at least I hope it is for you like it was for me. It was the perfect recipe to use the leftover turkey we had from Thanksgiving. I’d love to say that I make this recipe every year but sadly, most years, my leftover turkey recipes consist of turkey sandwiches. Womp womp. But this year I was determined to make something exciting from leftovers. Originally, I wanted to make a rich, hearty turkey pot pie. But after such an unhealthy week of eating, I needed something a little lighter. Ah ha! I’ll make chicken noodle soup! Err, I mean turkey noodle soup. It’s been consistently cold here in Atlanta so I thought it would be a great comfort food to keep me warm this past weekend. And man was I right! This soup was just the comfort that I needed. Plus, I had an excuse to buy some crusty french bread to enjoy along side of it. It wouldn’t be a meal if it didn’t have a side of carbs to go with it, am I right?! This soup is so so easy to make. It only takes about 30-40 minutes from start to finish, including prep. Perfect for weeknights! And the flavor?! Ohhhh man, guys. The herbs add such freshness that cannot be found in canned soup and a splash of lemon juice brightens up the soup that you cannot imagine making turkey/chicken soup without it again. I was so surprised by the flavor that the lemon juice added. Seriously so yummy. You can easily use chicken instead of turkey. So don’t forget about this recipe later down the road when you have leftover rotisserie chicken to use! I love using egg noodles for noodle soup. But you can use any pasta noodle you like: rotini, chopped fettuccine noodles, heck, even bowtie pasta! Like I said above, this is a quick recipe that you can easily make during the week. But if you want to make it even easier, you can prep the veggies ahead of time. It’ll save you about 10 minutes, depending on how quick you chop. This recipe yields a noodle-heavy soup. If you want it more brothy, you can add 1-2 cups of water to loosen it up. But I suggest you wait until after the noodle step before you decide. That will give you a better idea of what the final soup will look like. Just because you’re making a lighter soup, doesn’t mean you can’t be a little bad, too. I love serving this soup with a piece of crusty french bread. Instead of buying a whole loaf in the bakery, I buy frozen french bread rolls so I can heat up one when I need it and won’t end up wasting a whole loaf. I hope you love this recipe! I definitely did. What other recipes do you have for turkey leftovers? I still have about 2 cups to use! A super easy soup to warm you up on cold nights. And the perfect way to use turkey leftovers! Add olive oil to a large pot or dutch oven. Turn heat to medium-high. Once olive oil is warmed, add celery, carrots, and onion. Cook for about 7 minutes, or until veggies start to soften, stirring occasionally. Add minced garlic and stir into veggies. Let cook for 1-2 minutes but do not let it burn. Add chicken broth, bay leaves, dried thyme, dried oregano, and black pepper. It will sizzle violently, which will help scrape off the browned bits from the bottom of the pan. Bring broth to a boil and let boil for 5 minutes, or until veggies are tender enough to cut with a fork. Add egg noddles and cook for 8-10 minutes, until al dente. If the broth is too low for your taste, it's okay to add 1-2 cups of water. Add chicken, fresh parsley, and lemon juice. Let it boil for 2 more minutes, until chicken is warmed through. Taste the soup to see if it needs salt. If so, add about 1/2 tablespoon of salt. Keep adding more if the soup still needs it. I added about 3/4 tablespoon in total. Serve immediately and enjoy with a great piece of crusty bread. Yummm! You can refrigerate leftovers for up to 7 days or freeze for up to 6 months. Made this soup last night & it was delicious! I love the smell of oregano & thyme but I didn’t put the entire amount of noodles because I wanted it more soupy! My husband & I thank you! Easy recipe as i tend to have these ingredients on hand. I did end up using a total of 12 cups of water (used chicken bouillon cubes instead of broth, no need to add additional salt) as i felt once i added the noodles there was not enough liquid. Next time i will only do 1/2 teaspoon pepper, too peppery for my liking. Otherwise made this almost exact and turned out really good. Yay thanks for the feedback! So glad you liked it! Made this tonight! Turned out great! Yay! Thanks for the feedback Klarissa! So glad you loved it. What a delicious looking soup! Perfect for using up that leftover turkey. This looks insanely delicious and I’m so glad you posted it. I’ve been in the mood for soup the past few days and I think this will hit the spot. Thank you! This looks amazing! We make soup on the day after Thanksgiving, too – it’s the best tradition. Wish I had seen this earlier when I had a lot of left over turkey! I’m definitely pinning this for later!! Great swap for the classic chicken! What a cozy bowl of soup! Thanks so much!! I’ve been makijg so much soup too! This soup looks so delicious that it makes me wish I’d made a turkey instead of lasagna for Thanksgiving this year! But, I do plan on having turkey for Christmas Eve dinner, and you can bet I will be making a pot of this soup with the leftovers! Awww lasagna sounds so good too! If you get a craving for this soup before Christmas, you can easily use chicken instead!!! Turkey noodle soup is the best! I could use a bowl right now!! Yay! Glad I could make he list! Stay warm!!! Oooh delicious. I love finding great ways to use up leftovers and this soup sounds light and filling and flavourful, especially with those gorgeous herbs and a sprinkle of lemon. Great tip on buying the French bread rolls too, it’s so handy to have a batch in the freezer ready to go when you need a little crunch to dinner! I’m telling ya…that lemon makes a huge difference!!! And I’m glad you appreciate the tip about the rolls. It’s so perfect for leftovers since the btead won’t be stale the next day! Yum! Great recipe esp for Thanksgiving leftovers! YUM! My daughter is a little under the weather and I was just thinking I need to find a yummy soup recipe. Thanks! Ae I hope she feels better. This soup should help a little! I was just telling my husband that I wanted to make some soup this week! our recipe looks amazing! This is one of my favorite types of soups! So yummy:) Thanks for sharing! So perfect for this time of year! Such a great way to use up leftover turkey. Mmmm this is a proper leftover roast dinner comfort food recipe! I love a good turkey noodle soup, me! Exactly! I love it too! Thanks for stopping by! A great recipe! I might make this today I’m feeling a little under the weather. Aw I hope you feel better!!! This looks absolutely yummy and a great way to use turkey! We smoked turkey this yer so this will be perfect to try. Yummmm! Smoked turkey will add an even deeper flavor to the soup. I hope you like it!! Wow, those turkey soup looks so amazingly yummy. I don’t have turkey but definitely going to try this with roast chicken! Pinning this for later! Yessss! It’s perfect for chicken too! Nothing warms you up on a cold winter day like some good soup. Love this recipe and will be trying it out very soon. Thanks for sharing. Exactly!! I hope it keeps the cold away! I just got done straining stock from the turkey bones. I’m using your cue to make the soup. I like the noodles and also that bread that’s about to be dunked…YA, baby! Omg I bet turkey stock tastes even better in this soup. Great idea! This is such a simple, brilliant idea for leftover turkey! Oh yea making this soup this week! Got all the ingredients leftover in my fridge from Thanksgiving 🙂 can’t wait! That’s awesome!! I hope you love it too! Oh what a wonderful way to use holiday leftovers and such a comport food! This chicken noodle soup looks so fresh and delish. Love making homemade soup. I have been craving soup lately and this looks SO GOOD! Thanks for sharing your recipe! I agree with what you say, making a soup from scratch ensures you get the best flavours and also it has none of the thickeners you get with bought soups. Exactly! I love the flavor of fresh soups. Aww I hope you feel better! Yes, this will be the perfect comfort to help you feel a little better! LOVE this! Perfect way to use the leftover turkey annnnd to keep warm this week…because, the holidays season also means the start of the “bundle up” season. Thanks for sharing! Yessss! I was so happy to have a new go-to for turkey leftovers. My daughter works at a mall and you are not kidding – Friday was bonkers indeed! Speaking of bonkers, I’d be bonkers not to love this soup – crusty bread or not! Oh wow! I bet she was exhausted after that! Shopping at this time of year is only enjoyable if you have the time to do what you want to, no pressures and can switch off from the rat race surrounding you! Online is so much easier. Lovely recipe, an easy to make wholesome meal. I do like a good soup at this time of year, always very warming.